We in the North often have a highly skewed understanding of the word ‘poverty’. Mention it, and the mind is immediately filled with images of emaciated children, queues at aid stations, and the like. Somehow our own acute poverty – in community, social cohesion and ethical purpose – usually goes unrecognised. We live in a consumer-oriented society where our own personal fulfillment and happiness is dependent on that next ‘must have’ purchase, yet can’t see the truth of this hollow form of existence. The happiest people you can see on the streets of our cities are those in the billboard advertising all around us – its actors possessing artificial smiles almost as large as the overflowing shopping trolleys, baskets and bags they carry. We also can’t see that the true cost of this energy intensive but empty ‘life’ is externalised – paid for by our environment and the far-removed and faceless billions that live in other parts of the globe. We can’t see that our lifestyles are running up the tab from hell, promising depletion and even war. 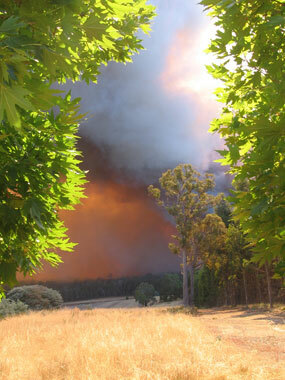 Information about which trees are fire retardant and which are accelerants, about how retardants and accelerants work, and some design and management “do’s and don’ts” which could make a difference to the safety of live and property. Kiva’s mission is to connect people through lending for the sake of alleviating poverty. Kiva is the world’s first person-to-person micro-lending website, empowering individuals to lend to unique entrepreneurs around the globe. The people you see on Kiva’s site are real individuals. When you browse entrepreneurs’ profiles on Kiva, choose someone to lend to, and then make a loan, you are helping a real person make great strides towards economic independence and improve life for themselves, their family, and their community. Throughout the course of the loan (usually 6-12 months), you can receive email journal updates and track repayments. Then, when you get your loan money back, you can relend to someone else. Kiva partners with existing microfinance institutions. In doing so, we gain access to entrepreneurs from communities world-wide. Our partners are experts in choosing qualified entrepreneurs. That said, they are usually short on funds. Through Kiva, our partners upload their entrepreneur profiles directly to the site so you can lend to them. When you do, not only do you get a unique experience connecting to a specific entrepreneur on the other side of the planet, but our microfinance partners can do more of what they do, more efficiently. Kiva provides a data-rich, transparent lending platform. We are constantly working to make the system more transparent to show how money flows throughout the entire cycle, and what effect it has on the people and institutions lending it, borrowing it, and managing it along the way. To do this, we are using the power of the internet to facilitate one-to-one connections that were previously prohibitively expensive. Kiva creates an interpersonal connection at low costs due to the instant, inexpensive nature of internet delivery. The term permaculture–a combination the words “permanent” and “agriculture”–was coined in 1978 by Australian ecologists Bill Mollison and David Holmgren to describe an “integrated, evolving system of perennial or self-perpetuating plant and animal species useful to man.” According to the National Sustainable Agriculture Information Service, “It is a land use and community building movement which strives for the harmonious integration of human dwellings, microclimate, annual and perennial plants, animals, soils, and water into stable, productive communities.” While permaculture is often associated with communal living, its principles can be used in rural or urban setting to create a sustainable, organic garden that minimizes environmental impact. Our zone map is created by thousands of gardeners from all around the world. Sign up and add your zone! I’ve always been interested in sustainable ways of growing food. Ever since I read Forest Gardening by Robert Hart I’ve had idle thoughts about planting a small orchard in my back garden. I’ve dabbled here and there but when I moved into my new house in 2008 I decided to start planning. After a lot of head scratching and preparation I planted the first trees that winter. The aim of this website is to document how the garden develops, share experience and to provide some links to sources of information to help anyone else interested in doing something similar.